Electric fireplace or stove heaters don’t get the best marks for efficiency, but owners still love them because they provide a pleasant focal point in any room where they can be plugged in. They’re also convenient — most can be operated with a remote control. And they generally come in a range of sizes for different spaces. Smaller units will be easier to move, while larger units with mantels or other features may be realistic enough to fool visitors into thinking that they’re real fireplaces or stoves. 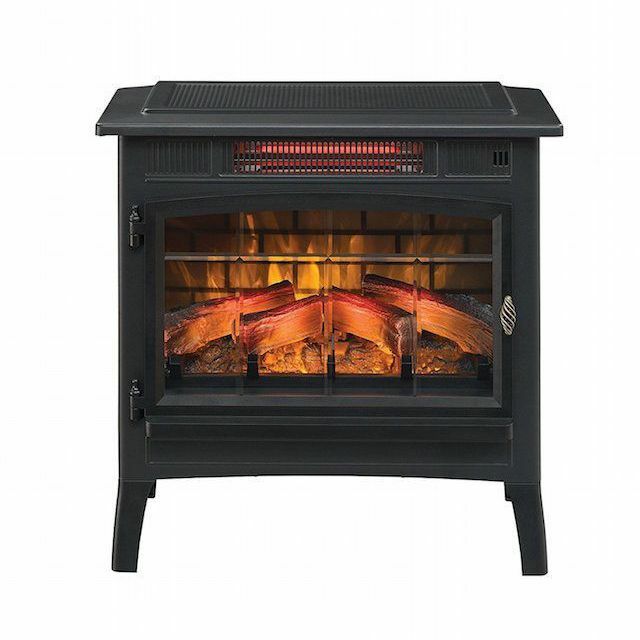 Buyers who want a robust little fireplace heater like the Duraflame DFI-5010-01 Infrared Quartz Fireplace Stove, which is roughly 24 by 23.5 by 13 inches. It’s best for rooms up to 1,000 square feet (note that reviewers say it’s more effective in smaller spaces, however) and looks like a traditional metal stove. Owners love that they can turn on the artificial glowing logs and embers separately from the heat if they want a little ambiance in a room that’s already toasty – there are five brightness settings. It also stays cool to the touch, which is important for families with pets or small children. The unit comes with a remote control. Read more reviews of the best electric fireplace heaters available to purchase online. Ceramic space heaters are among the most common kind of portable electric heaters. These heaters draw air over a hot ceramic plate before using a fan to blow that air back out into the room. They are typically compact enough to carry from room to room and plug into the wall. Some oscillate to send heated air in different directions. Most are meant only for supplemental heat in smaller rooms, though there are some more powerful units for larger spaces. They can heat a room quickly, but the fans make them a bit noisy. The blowing air might also irritate allergy sufferers. Reviewers say the Lasko 6462 Full Circle Ceramic Heater is a great choice for heating up a small living space or bedroom fast. The heater oscillates and has a remote control for easy operation. Its tall, sleek design will blend into most modern homes, and experts praise its cool-touch housing and automatic overheat protection. Owners say the 6462 is relatively quiet for a ceramic space heater, and experts agree, giving it high marks for lack of noise. Still, it’s worth noting that ceramic heaters are still louder than most other kinds of electric heaters. They also shouldn’t be used too close to curtains or other combustible materials. 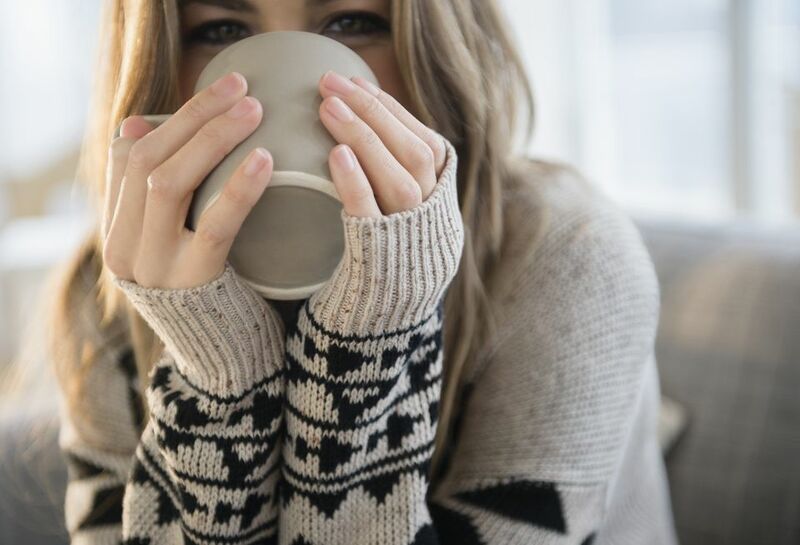 Check out our other reviews of the best space heaters available on the market today. Sleek, compact, and convenient, the Honeywell UberHeat Ceramic Heater delivers an impressive amount of heat for such a small appliance—you’ll never have to suffer through ice-cold days in the dead of winter again. It uses ceramic heating technology (up to 1500 watts) to heat whatever room you're in, and it's easy to customize to your liking. There are two heat settings and an adjustable thermostat. If you're worried about your electric heater becoming an eyesore in your home, users will be pleasantly surprised with the sleek design of this appliance. The Honeywell UberHeat Ceramic Heater comes in black or white, and measures 9" x 6.5" x 10.2", so you can position it nicely on a desk, nightstand, or end table. Most other ceramic heaters tend to be clunky eye-sores, so you'll actually be excited to find a place for this stylish appliance. If you’re strapped for space, a panel heater could be a more efficient option for your home, as they can be mounted on the wall. As such, they take up significantly less room than other space heaters, while still producing the supplemental warmth you need. If you’re looking for a top-rated panel heater for your home, the DeLonghi HMP1500 Mica Panel Heater has rave reviews from users, as it quietly produces 1,500 watts of heat. The DeLonghi Panel Heater has a simple black design that will look inconspicuous in your home. It comes with a standing base so you can put it on the floor, as well as a wall mount. The heater has an adjustable thermostat and two heat settings, and since there’s no fan involved, the unit produces heat silently — great if you’re a light sleeper! This space heater includes Safe Heat technology, including thermal cut-off, tip-over protection and a power indication light. All these features are designed to keep your home and family safe as it warms up your space. Baseboard electric heaters are a great solution for rooms that have large windows, as they can counteract the heat that is lost through the glass. To size an electric baseboard room heater for your space, make sure to measure the room it's heating and consider the number of windows in the space. For a medium sized space, the Cadet Manufacturing 120-Volt Baseboard Heater is a great option. The heater has to be hardwired into your home, which provides a seamless connection without any tangled wires or plugs showing. The device is 1,000 watts and is made of steel, so it will last for many years to come. Reviewers say this baseboard heater is great in all sorts of rooms and solves the issue of dealing with cold winter weather. Just be sure to keep the heater 12 inches away from any furniture or other items to prevent heat damage. If you prefer the look and feel of electric baseboard heaters, here is another top-rated option that you should consider. The Marley HBB1254 Qmark Baseboard Heater has an elegant design, and it's highly efficient at heating up any given room. While this model is definitely more expensive, it has an impressive output of 1,250 watts. Because of this unit’s heat retention quality, heat continues to radiate even after the thermostat turns off, which is truly the mark of a top-notch baseboard heater. In addition, there’s a range of accessories available, so you can customize it to your liking. Infrared space heaters rely on quartz bulbs to generate heat that is then dispersed via some sort of reflective metal element and a low-powered fan. These plug-in heaters mainly transfer warmth to other objects in the room rather than circulating it through the air. The result is slower, more even heat that many people compare to the sun’s rays. They are typically quieter than ceramic space heaters, but can get quite hot to the touch. Most infrared space heaters are also fairly bulky, so they aren’t a great pick for anyone short on square footage. The Lifesmart 6-Element Large Room Infrared Quartz Heater is a good pick for anyone who needs more even warmth in an open living room or a space with high ceilings, and reviewers love that it takes away the chill quietly. A digital thermostat, remote control and 12-hour timer make it convenient to use, too. It’s housed in a wooden cabinet that most owners find attractive, especially those with traditional décor and wood trim. At 24 pounds, it’s not the lightest heater to move around, but the heater does have casters to ease the task. Check out our other reviews of the best infrared space heaters available on the market today. When you don’t want your space heater taking up floor space and getting underfoot, a wall-mounted unit is a great option. This one from ThermaFlo is simple and sleek and perfect for your home or garage. It heats up to 200 square feet and has a night light, making it an especially good choice for bedrooms and bathrooms. You can adjust the temperature to suit your taste, and it will automatically select which heat output (750 or 1500 watts) is needed to keep it there. It’s simple to mount over an electrical outlet, no tools are necessary, and can be positioned horizontally or vertically. It measures 12" x 8" x 4.5", and weighs just 4.5 pounds, so it’s easy to move around to wherever you need to chase out the chill. Reviewers say it puts out a nice amount of heat for such a small machine. " Another wall-mounted option that we love is the Stiebel Eltron Wall Mounted Electric Fan Heater. Boasting a clean surface-mounted design and a wide array of cutting-edge features, the Stiebel Eltron Wall Mounted Electric Fan Heater is reliable, quiet, and user-friendly. It can stand alone as the heat source for small rooms or apartments, or it can act as supplemental heat for larger rooms. This wall mounted heater has a built-in thermostat and frost protection setting, which can be controlled by the built-in thermostat. You can also install this unit in virtually any room in your home, and it can even be installed over existing heaters. The more energy efficient an appliance is, the less it costs to run, and the better it is for the environment—from both an economic and sustainability standpoint, the benefits are huge. The Dyson AM09 Fan Heater provides a wonderfully efficient way to heat your home, thanks to its patented Air Multiplier technology and intelligent thermostat that carefully maintains your desired temperature so that zero energy is wasted. With some heaters there's a noticeable odor, but not with this model. Dyson's fan heater has no exposed heating elements so there's zero burning smell and no safety risk. Other notable features include a magnetized remote that you can store on top of the machine, a sleep timer, and extra wide projection to mix the surrounding air. We bought two of our readers’ favorite electric heaters and our reviewers tested them for 143 hours. We asked our testers to consider the most important features when using these heaters, from their temperature control to their heating element. We’ve outlined the key takeaways here so that you, too, know what to look for when shopping. Heating element While all electric heaters rely on being plugged into a power source to generate heat, the type of heating element can vary. Ceramic heaters have a heated ceramic plate that warms the air inside the unit before it’s blown out into the room by means of a fan. There are also infrared heaters that use quartz heating elements to warm air that is most readily absorbed by objects in the room. Standard electric heaters convert electricity into radiant heat by passing the current across coils or strips of metal before it is directed into the room as warm air, usually via a fan or reflectors. Square footage Consider whether you’re looking for an electric heater for a small personal space or to warm a large room. Not all electric heaters are up to the challenge of heating a big area and trying to use an underpowered electric heater will prove to be inefficient and ineffective. In general, the more square footage you have to heat, the more watts you want in an electric heater. For a 10’ x 10’ room or smaller (assuming the home has average insulation), an electric heater with up to 750 watts of power should be sufficient. For larger rooms of 20’ x 20’, look for a unit with 1,500 watts or more. Temperature control Some electric heaters only have an “on” or “off” mode, without the ability to set a specific temperature. Other electric heaters are equipped with a dial thermostat setting or a digital thermostat that makes setting your target temperature super simple. Electric heaters with a thermostat may be more efficient in the long run since they can turn on and off to maintain the right temperature without wasting energy. Declaring this electric heater “well worth the cost,” one of our testers also loved how it looked and felt like a real fireplace. According to our reviewers, it controlled the heat of a room well and provided a great ambiance. “It has really brightened up our living room and it adds cheer to our apartment during fall and winter,” raved one of our testers. The only notable downside, according to our reviewers? Controlling the temperature settings proved a bit difficult. “You can't change the temperature from the remote. You can't turn the temperature down; you have to cycle all the way up and start over,” one of our testers revealed. Our testers loved how quickly this product heated up a room, with the “bonus” of having three modes to choose from: 90-, 180-, or 360-degree rotation. Our reviewers also liked the convenience of the remote and the fact that the heater was portable. “[It’s] easy to use in multiple rooms without it being hot to touch,” explained one of our testers. Other notable perks, mentioned by our reviewers, included the temperature reading on the LED screen and easily accessible filter for cleaning. On the other hand, one of our testers wished it were more energy-efficient and also hoped for more safety features, like an automatic shut-off. In the end, though, “the positive attributes outweigh the negative,” according to one of our reviewers.